"Medal of Honor" players can still control enemy fighters, but they'll be called "Opposing Force," not "Taliban." Multiplayer mode still exists, but fighters will be called "Opposing Force"
(CNN) -- Plans to let players control Taliban fighters in the highly anticipated "Medal of Honor" video game have been scrapped amid harsh criticism from military officials and others. Game publisher Electronic Arts said Friday that it has decided to remove the name "Taliban" from one of the forces in the multiplayer version of the game, which focuses on modern-day fighting in Afghanistan. The game is set to be released October 12 and is expected to be one of the top video-game rollouts of the year. Executive producer Greg Goodrich said the development team listened to feedback from friends and families of fallen soldiers who expressed concern over the game's option to let players fight as the Taliban. "This is a voice that has earned the right to be listened to. It is a voice that we care deeply about," Goodrich said in a written statement. "Because of this, and because the heartbeat of 'Medal of Honor' has always resided in the reverence for American and Allied soldiers, we have decided to rename the opposing team." Players still will be able to control the fighters -- which are the enemy when a player is playing the game alone -- but they will be referred to simply as "Opposing Force." In recent months, British Secretary of State for Defence Liam Fox made headlines when he called for retail stores to ban the game. He told London's Sunday Times that he was disgusted and angry and asked stores to show support for the military and military families by not selling "Medal of Honor." "It is shocking that someone would think it acceptable to recreate the acts of the Taliban," Fox told the newspaper. "At the hands of the Taliban, children have lost fathers and wives have lost husbands." The U.S. military's Army & Air Force Exchange Service had asked on-base stores not to stock "Medal of Honor." "Out of respect to those we serve, we will not be stocking this game," said Maj. Gen. Bruce Casella, the service's commanding officer. "We regret any inconvenience this may cause authorized shoppers, but are optimistic that they will understand the sensitivity to the life and death scenarios this product presents as entertainment." Jeff Brown, a spokesman for EA, said the controversy surprised the game publisher. "The misunderstanding starts with people who don't understand the dynamics of video games," Brown said. "There are cops and robbers, good guys vs. bad guys, in nearly every game, and we were surprised to be reminded that not everyone gets that dynamic." He said EA received many letters from consumers, including military and retired military personnel, who supported the company's right to produce the game in its original form. Brown said it was comforting to get those letters of support because it showed the development team that they weren't doing anything that was out of bounds or exploitative. "We do stop and take measure of people who are offended," Brown said. "People who say it is difficult actually seeing the Taliban when we've lost someone to the war." William Gaunter, a former U.S. Navy medic, helped play-test the game. He supported the game in its original form but said he wasn't surprised by the backlash. The war against the Taliban "is happening right now as we speak," Gaunter said. "The American public -- there is a certain time period when they are willing to accept as playing the enemy. There is a cutoff somewhere." Other popular war-game franchises have allowed players to compete as historical U.S. enemies, including the Nazis, in their multiplayer modes. 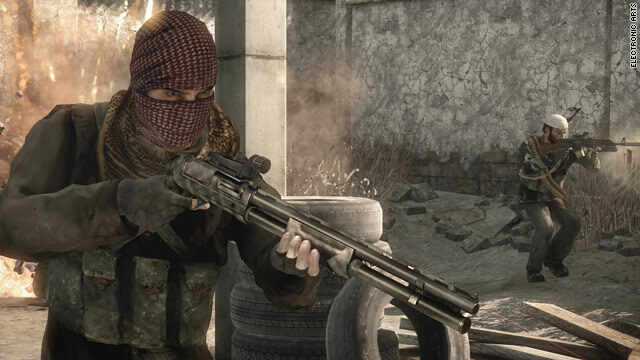 Games like "Call of Duty: Modern Warfare II" have allowed players to control Taliban-like forces, but they weren't directly identified by that name. Some military personnel and veterans served as consultants to EA to help make sure the game was both accurate and respectful to U.S. and allied troops. He said that actually naming the Taliban probably made the difference to critics. "Since [other games] didn't use that name, it really didn't bother anybody," Gaunter said. "It looks the same as the Taliban [in the other games], but since they didn't use the name, they don't get the controversy." EA's Goodrich said that removing the "Taliban" name does not fundamentally change the gameplay. He said the majority of the feedback on the game has been positive, but EA chose to make the change "for the men and women serving in the military and for the families of those who have paid the ultimate sacrifice." Brown, the EA spokesman, said he thinks opinions about the game's original design were largely generational. "Younger people who are familiar with video games [and] the good-vs.-bad concept are okay with that," he said. "Older people who don't play games and understand the concepts have a problem with it." "If you aren't a person who plays these games, you aren't going to understand the dynamics of the game," he said. "It is a game. It is not real life. I don't correlate the two."